So what do teachers love? How can you show them gratitude? 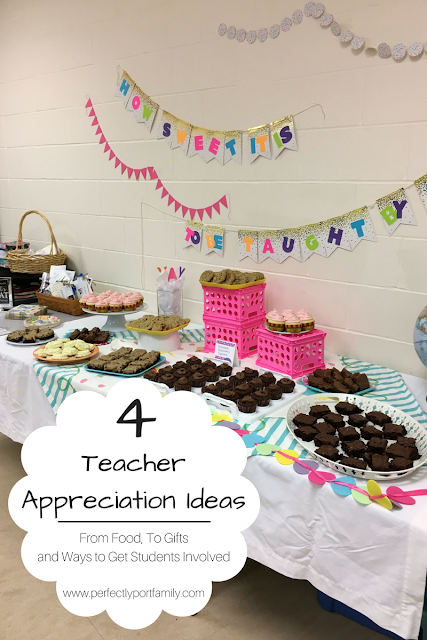 Here is a list of ideas you can do to bless your teachers for all they do! 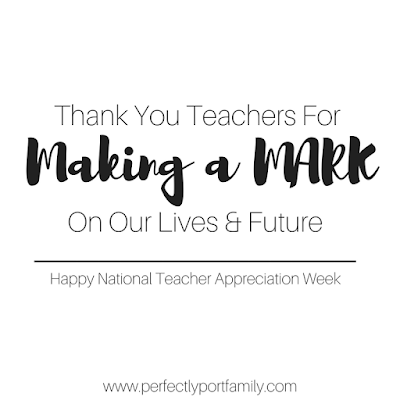 Don't forget to decorate the teacher workroom to make the teachers feel extra special -- maybe a fun banner like this or this. Then simply add these letters for a customized saying! Many of the fun decorations, we picked up at the Target Dollar Spot and celebration/birthday section. You can add tablecloths, some fun decor and it will be a fun place for them to feel celebrated. They don't get the opportunity to go out to lunch very often because many of them only have 20-30 minutes lunch time! This year we went with a week long theme, How Sweet It Is To Be Taught By You. 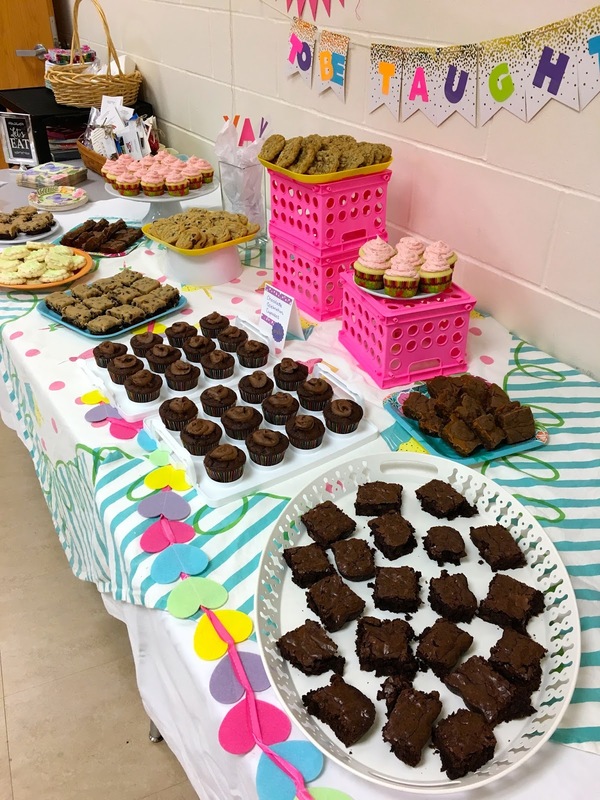 Then everyday we provided a sweet treat in their workroom for them to enjoy! We ordered in Dunkin Doughnuts and coffee for the teachers to greet them Monday morning. I don't know anything better to chase the Mondays away then a sweet treat and caffeine. 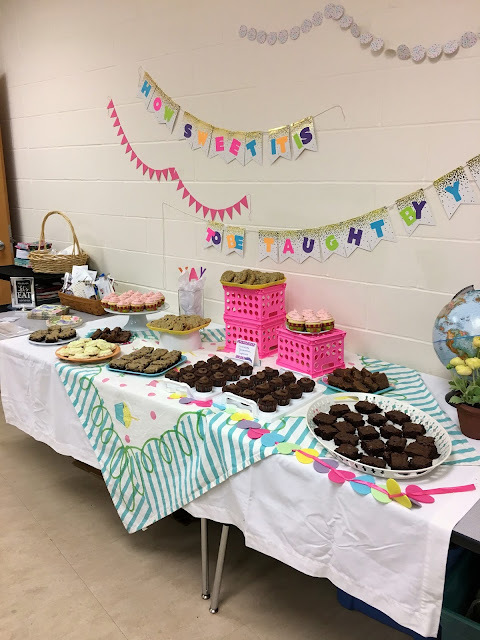 We used sign-up genius to have parents volunteer to bring in a variety of homemade baked goods including cupcakes, bars, and cookies. We provided little to go bags as well as plates and napkins for them to enjoy the yummy treats all day long. We catered a lunch for the entire staff from Panera Bread. We got 8 salads and 80 half sandwiches. They provided baguettes, chips, pickles and all dressings on the side as well as clear, plastic plates, tongues, silverware and everything was clearly labeled. It is such a treat for them to get a "lunch out" and not a sack lunch from home. The leftovers were all left in the fridge and quickly disappeared too! By Thursday, we thought it was time to let the bellies relax and provide a fresh fruit option. We provided kabobs and clear plastic cups for the teachers to make their own little sweet fruit treat! Who doesn't love an ice cream truck or mobile snack cart? 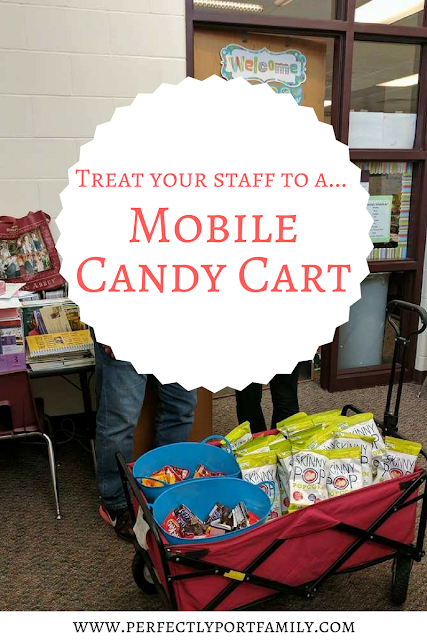 We turned a wagon into a fun, refreshment cart full of candies and popcorn. Our principal then took it around to each classroom and the staff could pick out a fun treat. 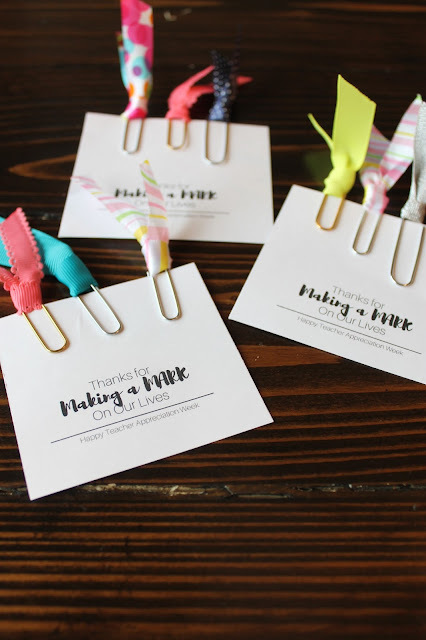 We stuffed their workroom mailboxes with these fun bookmarks! 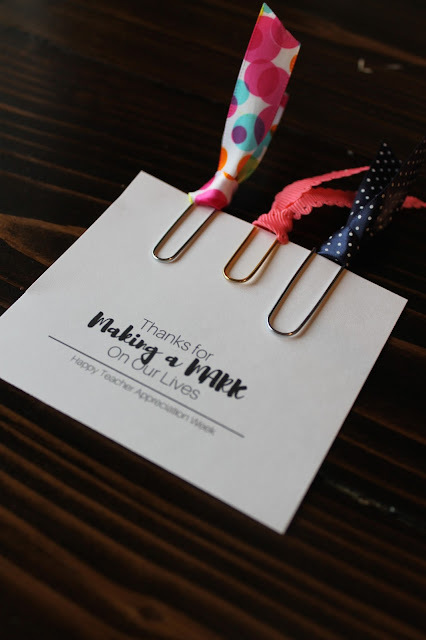 You simply take some thin ribbon, cut it to desired length (4-6 inches), gently burn the ends with a lighter to prevent fraying, and then loop through a large paper clip. We gave each staff member 3 on the card (I included an image of the card for you to save and print at the end of this post). We made posters to line the entrance to the school. We borrowed some realtor signs as well as these-type signs, poster board, and poster board letters to make 5 signs. They said: Thank You Staff; For All You Do; How Sweet It Is; To Be Taught By You; Our Future is Brighter Because of You! In addition to all the fun food and treats, we asked each family to voluntarily participate in daily activities for their teachers! The highlight was the making of a class bouquet of flowers. For the specials and auxiliary teachers, PTO provided a bouquet of flowers in a vase. 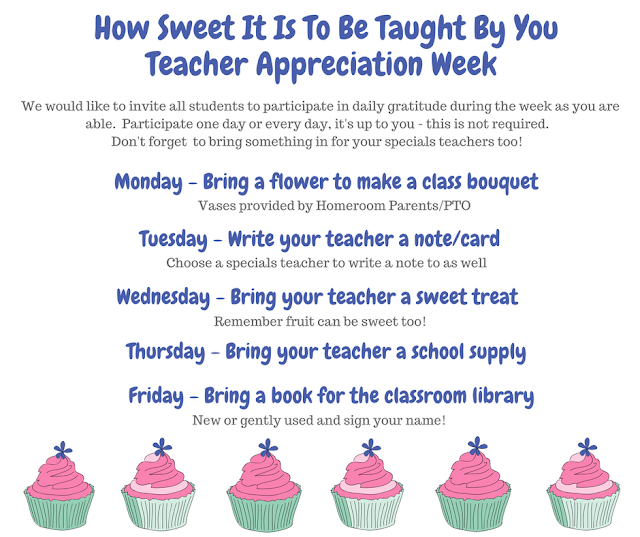 We have a teacher appreciation committee and special budget within our Parent-Teacher Organization. 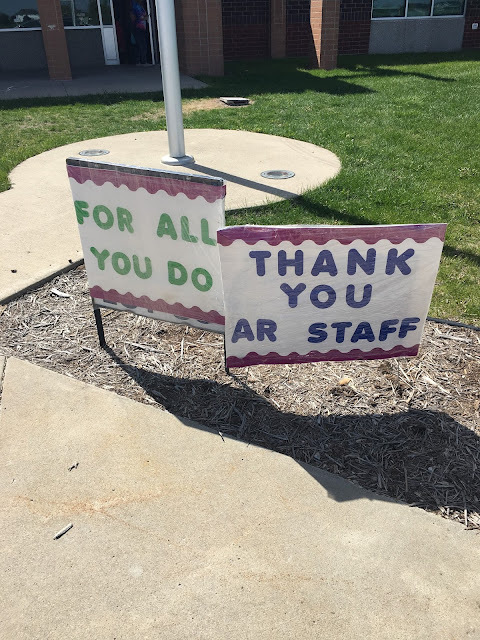 If your school doesn't do something collectively, you can totally do something as a family to shower your teacher with love and gratitude. You can deliver your teacher's favorite food from a local restaurant, drop off their favorite caffeinated beverage one morning, provide a gift card for classroom needs, or send in some much needed school supplies or books for the classroom library. The options are endless!